I mentioned my "ugly sweater" Christmas party printables to my sister and her office thought it was a great idea for their office Christmas party. 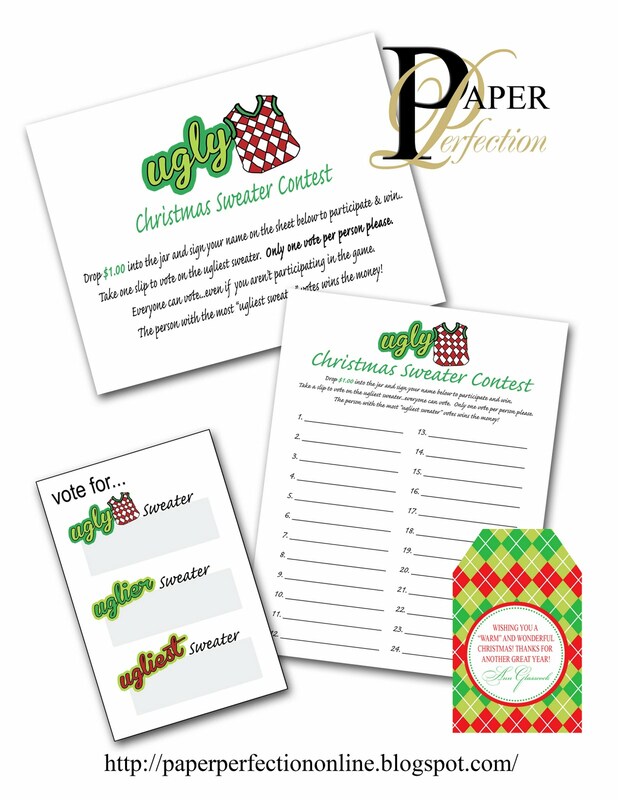 She needed a few games that would work for the party so I passed along some ideas including these printables for the "Ugly Sweater" competition. Everyone that wants to participate must throw $1.00 into a jar in order to win. Then everyone at the party (even if they didn't enter the competition) gets a chance to vote on the ugliest sweater and the winner gets all of the money in the jar. I also made a gift tag that matched the "ugly sweater" theme for my sister to attach to a mug filled with packets of hot cocoa for her employees. When I think of sweaters, I think of being warm so a hot chocolate gift is a perfect match! If you need printables for your next event whether it is a Christmas party or office gathering contact Paper Perfection at jtanddolly@yahoo.com for pricing and details.